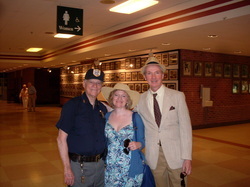 Tom & Lily with Rudy Baffa, Belmont Park (2013). This past June, Tom spent a couple days at Belmont Park, doing some writing and catching up with a few special friends. Here he is with Lily and the inimitable Rudy Baffa, Security Crooner. Hey Tom, when's the next one coming out? You'll notice I'm calling it a follow-up, rather than a sequel. Because it's actually a prequel; it takes place nearly thirty years before the events in Stride for Stride. But I want to assure everyone who enjoyed Stride for Stride that I believe you will enjoy this book thoroughly! It connects with the 'legacy' of Bright Dawn, in that we meet Bright Dawn's mother, but obviously King Stephen and Most Innocent are not in the picture yet. This story takes place during the Depression, starting in New York City but it travels a bit! We meet a ragtag group of misfits living in a rooming house on the Upper West Side who find out their landlady is in danger of foreclosure, and they concoct a wild scheme to save the rooming house, and themselves, and each other. I think a lot of readers will be able to relate to the problems of people living in tough economic times, and we'll also see some of the consequences of the bad economy, and even just good ol' greed (which transcends both time and economic climate), on those who are powerless and voiceless -- our animal companions. Perhaps most importantly, through all the challenges and difficulties these characters face, there is plenty of humor and courage as well. I can promise lots of interesting new characters, and you will see at least one face you know very well. And of course, you will meet some new friends of the four-legged variety! Keep checking here for more information. Right now Tom is looking for a publisher for the novel, and we would love to announce a publication date soon! We will keep you posted, and if you have not already, please sign up for Tom's mailing list! Let's jump right into 2013! Tom's third novella, GV, is available on Amazon.com, Amazon.co.uk and all the usual Amazons worldwide. Amazon informs us (and anyone who asks) that Tom's books are now available in India via Amazon.com. GV, based in the future, completes the cycle of these three novellas, with Hopewell Manor in the past and Blackbirds for Christmas in the present. Check out the Short Fiction page for more details about GV. As always, you do not have to own a Kindle device to read this e-book. Amazon provides free software so that you can read it on your gadget of choice. Lily Mars reads them on her PC AND her iPad! And if she can do it, so can you. Many thanks to Natalie Pryor for a fantastic cover. For the month of January 2013, 50% of Tom's royalties will be donated to Collie Rescue of the Carolinas. Amazon.es, although currently only in English. Kudos to Natalie Pryor, who once again designed a knockout cover. Want to download Blackbirds for Christmas right now? Of course you do! Click on the image to the right. The first of Tom's novellas, Hopewell Manor, is available now on Amazon.com, Amazon.co.uk and Amazon.de (although currently only in English). We have very thoughtfully provided a link so you can purchase it right now! We've mentioned this before but it bears repeating: you do not have to own a Kindle device to read this e-book. Amazon provides free software so that you can read it on your gadget of choice. You can find this on the Hopewell Manor page, on Amazon's Kindle menu or in the Kindle Store. It takes about a minute to install and you can have Hopewell Manor in your personal electronic library before you know it! A collection of three short novels is currently being prepared for publication for e-book readers! This is a new medium for Tom and we are all very excited about it. More details can be found on the Short Fiction page. Look for the novellas on Amazon.com. Note: While the novellas will be published for the Amazon Kindle platform, it is not necessary to actually own a Kindle in order to purchase and read them. You can download Kindle-reading software for your PC, Mac, iPad, Blackberry, or whatever gadget you prefer. We all know Tom Marshall is an entertaining and enlightening storyteller, but this month he is an award winner in a completely different arena. His paper on sponsorship in the thoroughbred racing industry, an expansion of his doctoral research, won Best Paper recognition at the Clute Institute Conference in Barcelona, Spain! Tom has been nominated for the Dog Writers Association of America Maxwell Medallion in the Short Fiction category. His story "Everyday Heroes" was the winner of the AKC Publications Fiction Contest earlier this year, and was published in the June issue of the AKC Gazette. Special thanks to Mara Bovsun and the staff of the AKC Gazette for presenting the story so professionally and for their confidence in putting "Everyday Heroes" in the ring for this prestigious award! Tom's short story "Everyday Heroes" has been selected as winner of the AKC Publications Fiction Contest! The story will be published in their upcoming (June) issue.